Gwen Abney-Cunningham, LMSW, is the DBT Services Supervisor at InterAct of Michigan, Inc. Ms. Abney-Cunningham received her Bachelors degree from Hope College and her MSW from Grand Valley State University. She has 25 years of professional experience and is a member of one of the first teams in the U.S. to apply DBT within an ACT program. 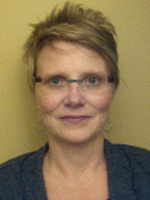 Ms. Abney-Cunningham is intensively trained in DBT and an experienced workshop leader at state and national conferences. Ms. Abney-Cunningham’s experience in DBT includes individual and skills training for adults, adolescents and families and providing DBT supervision to clinicians. In addition, she has assisted in the development and implementation of DBT on ACT teams and in outpatient settings. Gwen has been involved with the large scale implementations of DBT in Michigan for Community Mental Health settings. She has been a Behavioral Tech trainer for 14 years. Gwen has also has served on the Behavioral Tech Trainer Advisory Committee and is currently on the Behavioral Tech Implementation Science Workgroup.